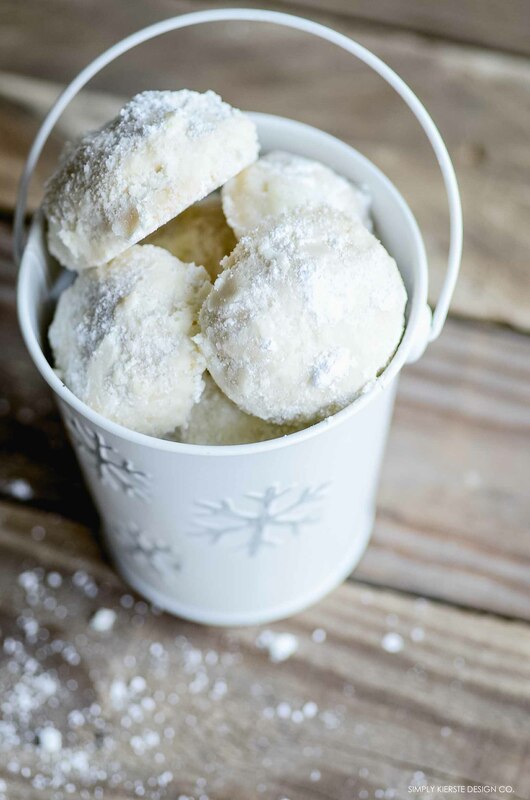 Snowball Cookies | Christmas Cookies | Simply Kierste Design Co. When I was growing up, every Christmas we would receive an eagerly anticipated package from my grandmother. It was packed full with all of her famous Christmas cookies and treats, and we couldn’t wait to get them. 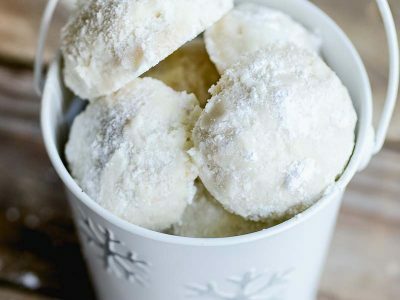 Snowball Cookies were always included, and they’ve long been one of my favorites. This classic shortbread cookie is rich, buttery, melts in your mouth, and is the perfect addition to your holiday baking! My grandmother actually called these Walnut Crescents, and they were shaped into crescents, baked, and then rolled in the powdered sugar. Over the years we changed them to balls (easier for kids to help with), but however you shape them, they are fabulous! The ingredients are few, but that’s all this cookie needs! I love how simple they are to make, and it doesn’t take long at all to whip up a batch. Do you have a tradition for the first day it snows? How fun would it be to make these? 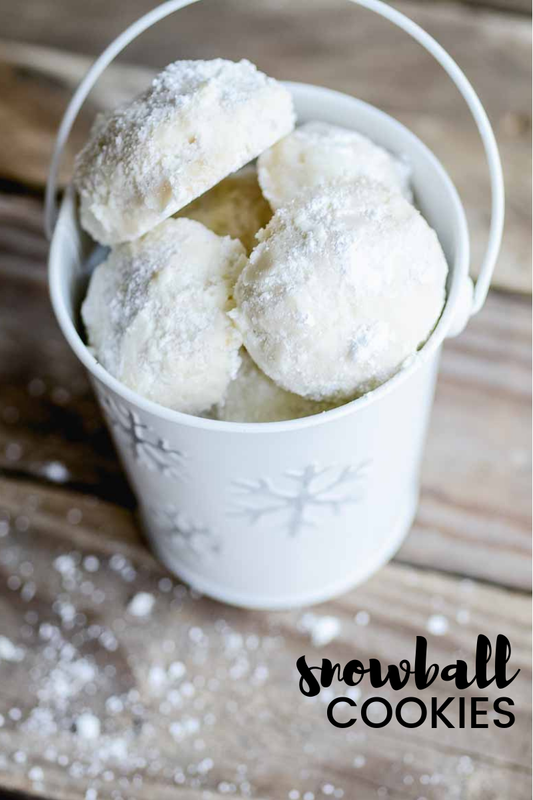 My kids love helping with these cookies, and I think the powdered sugar is a big part of it! 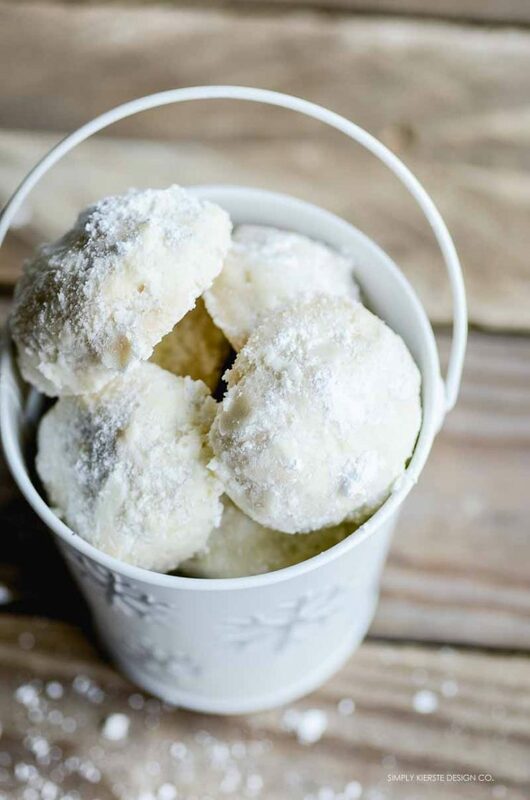 The powdered sugar dusting makes them a pretty cookie, and they’re perfectly perfect on any Christmas plate. 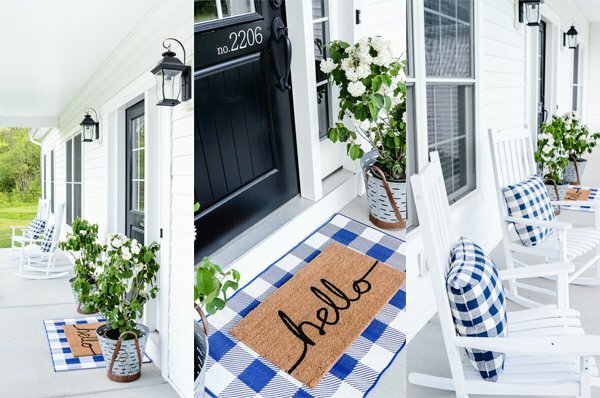 Set them out for guests, bring them to a party, wrap them up for friends or teachers, or enjoy them in your own home…they’ll be a hit no matter where you serve them! These cookies are my childhood…I LOVE them, and I think you will too! Beat butter and sugar together. Add flour and water alternately. When mixed, add vanilla and nuts. Shape into balls, place on a cookie sheet and bake about 15 minutes at 350 degrees. Sift some powdered sugar in a pie plate or on a cutting board. Place baked cookies in sugar directly out of the oven, rolling to coat completely. These are a favorite at our house too! Yum! I’ve never made these. Now I will! YUM! These cookies were a tradition in my family growing up. Then, I got married and forgot about them. I made them last year and my family went crazy over them. They are already asking for them. Love them!! Is there any other sugar to use besides the powdered sugar? They look like fun! Powdered sugar is the best for sticking to the cookie and really coating it–another sugar wouldn’t really do that. They are SO yummy! These are a family favorite! I should totally make them this year, it’s been a while. I think we must have all grown up with these! I didn’t make them for a long time either, and then when I finally did a few years ago, they went into our regular Christmas lineup! Hi Kierste…thanks for the recipe. Can’t wait to try it out. Before I do though, I just wanted to clarify. For the cold water, you list 2 T. Does that mean 2 tablespoon? My brain is refusing to decipher it at the moment. It depends on how big you make them, but I can usually get 2 dozen smaller cookies! Yes! We have made these for so long, our mom having the recipe for over seventy five years! She made these first in crescent shape, and then for many, many years the little snowballs. We changed the walnuts to pecans since many in our family prefer them. They are simple, but simply delicious! !